Spectra Shot might look like paintball ammo, but these standard steel shot pellets lethally penetrate ducks and geese while also identifying who made the shot. When a question arises about which hunter in the group made the kill, a new non-toxic shotshell ammunition can provide the answer. Polywad Inc., from Georgia's Red Earth Country, continues to keep the ballistics industry on a cutting edge of sorts. Jay Menefee, the president of Polywad, told me about a project that involved loading different-colored shotgun pellets into non-toxic waterfowl loads to allow an individual hunter in a party of four to retain his or her own signature. In effect, when that old nemesis, "Mr. 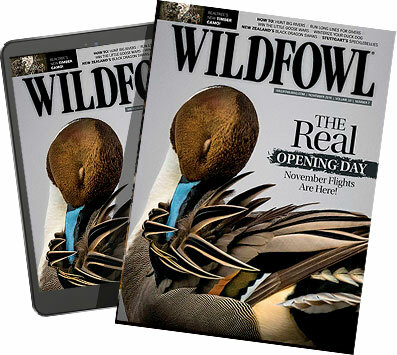 I Got It," surfaces in the blind, the colored pellet is a very direct solution to the problem. Offered by Spectra Shot, these standard steel shot pellets are coated with a special paint that won't come off or change color after being discharged from a shotgun barrel. Current loads in 1¼-ounce, No. 2 and No. 4 steel are contained in a 3-inch hull with a bore-safe wad, and a rolled crimped clear plastic disk that allows the shooter to see the payload and exact color of the pellets. I had yellow, blue, orange and green test loads. The loads that came into Ballistics Research & Development for testing were a blend of all colors, all in No. 2 pellets. I requested No. 2 shot for flexible use on ducks and geese. I took the loads to the range to pattern. Shooting my 870 Express 25-inch pipe with my own Dead Ringer choke tube, I shot 40-yard patterns on a clean, dead-air morning. Patterns on duck targets were impressive. With good shot quality under the bright yellow paint job, the overall pattern percentage was a strong 80 percent at 40 yards, and 94 percent at 35 yards. The recoil was normal for a standard high-velocity 3-inch, 12-gauge load. Getting shot on live waterfowl was not easy during the 2010-2011 hunting season. Ducks were scattered, and the freeze came early enough to close out many of my small and generally well-stocked prairie ranch dam areas. However, fall pheasants were abundant, so I put the colored shot to work. Hunting ringneck roosters with my Winchester Super X3, 3-inch upland gun mounting an Invector-Plus modified choke and a full magazine packed with Spectra Shot, I observed some cleanly harvested birds when well centered in the pattern. There is no doubt Spectra Shot has what it takes to harvest ditch chickens in a clean and efficient manner. I did pick off a few mallards on a flowing prairie stream, even when most areas were locked under a hard freeze. Ducks on the ground indicated the new loads are up to the task in the field. At 1,400 feet per second muzzle velocity, penetration by way of No. 2 pellets was very effective. No birds were lost to the fox or coyote on my watch. Facing a lack of live targets, I turned to static testing on dead, pinned snow geese for a very controlled penetration test. I shot yellow pellets at a range of 50 yards. For this test, I fired a Remington CTi105 shotgun with a modified choke. I delivered a single round to a medium-size snow goose mounted with its chest forward and wings spread completely out on the target board. I wanted to see if there was any significant drag against the painted pellets upon entry through the wound channel. As a control, I used a standard 1,400 fps steel No. 2 load, which I shot into the test subject at the same time as the Spectra Shot. I could not detect any difference in penetration between the brightly painted yellow pellets and the standard iron shot. Penetration was an adequate depth to enact vital organ damage. Black light loads are the next project on the list. Shooting Spectra Shot ammunition with the use of black light at night will produce a clear image of your shot string all of the way to the clay bird target. Spectra is trying to set up special shoots using black lighting so shotgunners will be able to see exactly what most of them have never seen in terms of pattern. I hope to have the chance to see this event in person. I have questions regarding shot behavior that still need direct answers. I believe the black light night shooting can clear some of them up. Spectra Shot Technicolor Shotshells is a unique, modern approach to shotshell ballistics. If the black light test works, it represents a real advance in observing how shot moves though the air at normal game contact ranges. We have learned so much about shotshell performance in recent years, largely because of the military developments in modern warfare ordnance. Black light, colored shot and good downrange ballistics will tack on even more data to our quickly building pile of information. The major problem Spectra Shot has right now is getting enough exposure among shotgunners. With the number of projects I have generated over the years, I can relate to the difficulty of getting the word out to the shooting public. For my part, I intend to also use raw Spectra Shot pellets in handloads, packing several colors into each shell to clearly mark the position in the resulting shot column of specific colors. Why? Because it is generally thought that the rear pellets in the payload tend to stay in the pattern core all of the way to the target. Spectra Shot can clear this little element of external shotshell ballistics up once and for all. 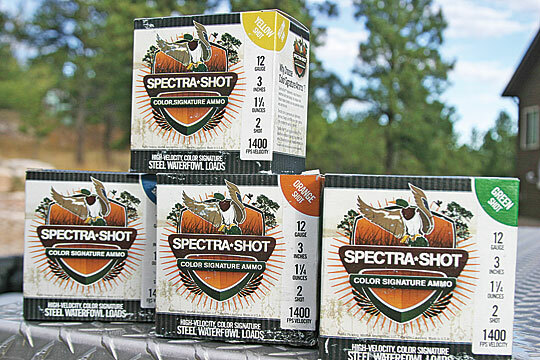 Spectra Shot Technicolor Shotshells have the ability to clear up a number of problems, including that boastful guy in the hunting party who claims every bird. I am sure you know who I'm talking about. Everyone has hunted with "Mr. I Got It."